Human Rights: Politics and Practice is the most comprehensive, most topical, and most student-friendly introduction to human rights. Bringing together a range of international experts including political scientists, philosophers, lawyers, and policy-makers, the book provides students with a broad range of perspectives on the theoretical and practical issues in this constantly evolving field. 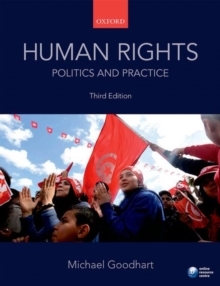 In addition to in-depth theoretical content, the book also features unrivalled coverage of human rights issues in practice, with a wide range of case studies to explore concrete examples from around the world. The third edition has been brought fully up-to-date with the most recent events and latest research developments in the area. Two new chapters have been added: one on religion and human rights, and one on sexual orientation and gender identity and human rights, introducing students to these important topics and expanding the theoretical and practical discussion of issues of universalism and relativism. The new edition also features a range of carefully developed pedagogical features to aid student learning, encourage critical analysis, and challenge students to question their own assumptions. The book is accompanied by an Online Resource Centre to enhance students' learning and provide valuable support for lecturers.